I have been eagerly watching my mailbox for the past week, waiting for a very special delivery to be made from Mike Wise in Georgia. It arrived on Thursday, just as cousin Mike’s postmaster had promised. What a treasure trove! And how generous of Mike to send me the disk with his Wise Guys family newsletter on it, along with personal research and photos. 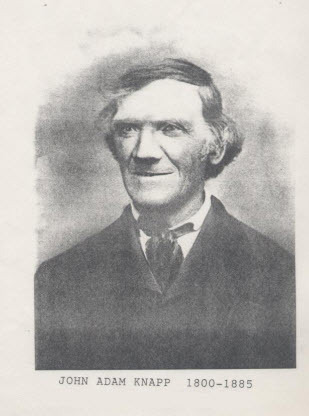 And speaking of photos – check out the photo of our our immigrant ancestor’s younger brother, John Adam KNAPP. As far as I know, this is the only photo I have ever seen of him. I think we can get some idea of what his brother, Franz Adam KNAPP, must have looked like. I don’t know if they resembled each other or not, but we can certainly speculate. I have my own ideas of who he resembles, but let’s hear from the rest of the Knapp clan…does anyone think John Adam looks like any of our present-day Knapp family? Post a comment or two and let us know what you think. And I just want to say a huge “thank you” to Mike Wise, for sharing his research with us. Mike has been at this for decades – and he a lot of great stories to share with us about the family. And here’s another sample of the great stuff yet to come: a photo of John Adam’s daughter, Mary KNAPP, with her husband, John J. WISE. During the course of the next few weeks/months, I will be organizing and uploading Mike’s research and newsletters to Knapp Notes – so we can all enjoy them. So stay tuned for more information/updates in the near future. This entry was posted in Family History, Knapp, Photos, Wise. Bookmark the permalink. 5 Responses to A treasure trove from cousin Mike! Fantastic family pictures of both sides of my husband’s family! 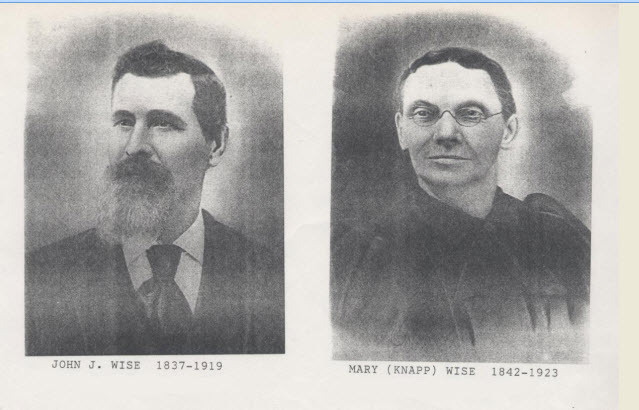 John Adam and Elizabeth Knapp’s daughter, Rosina (sister of Mary) married Barnhart Wise, my husband’s gggrandfather. John J was Barnhart’s brother. I met with Ray Wise many years ago, (founder of Ravenna Oil Co.) and talked with him several times by phone. He gave me lots of good information and his son took me to the house and showed me the F.A.Brader pencil drawing of the Barney Wise farm on Trares rd. Ray was very helpful and a fine gentlemen. Barney Wise was my Gr. Gr. uncle. The farm is still there complete with barn! Ray’s brother, F W “Bill” Wise, was my father in law…miss the great stories he loved to tell. He was the owner of Wise Oil Co., also in Ravenna. He said that when he was a boy, he fell out of a tree once and broke his neck. His Uncle Doc (Lewis Wise) put him in a cast from his neck down and it was a blistering hot summer. One day Uncle Barney, his grandfather, felt so sorry for him that he decided to cut the cast off before the right time and his head just “flopped to one side”. Bill said his father, Emmet, was fit to be tied! Apparently, he was all right because he lived well into his 90’s. Julie, thank you, the story that you have just shared with us is a perfect example of family stories that should be recorded for future generations so that they are not lost. It is a small story but gives us an “open window” into their lives.